Physical strength is a masculine characteristic. It is admired by all men, women and children – at least certain aspects of it. On the whole, most men not only admire great strength, but secretly desire it as well. It is a fact, however, that while only a small percentage of people possess some type of unusual strength, which may have been acquired through heredity or from specialized training, it is possible to acquire this attribute through progressive weight training or heavy lifting. Records in our files show that numerous individuals have doubled their strength after several months of training, and tripled it within a year’s time. It must be admitted, however, that not everyone can achieve such remarkable results in such a short length of time, although anyone can increase his strength to an amazing degree with proper training. There are some men who are naturally strong in certain regions, as, for example, the legs and lower back which are considered important strength zones. Other men have great strength in their arms and shoulders, but only a comparative few seem to possess all-round strength, which, of course, is the best and ideal combination. This combination of strength is not easy to obtain and may only be acquired through heavy training and supporting feats. Physical strength that is greater than average depends on a number of factors and not only upon the size and shape of muscles. Nevertheless, THE FEWER “WEAK LINKS” THE BODY HAS, THE GREATER THE POSSIBILITY OF ACHIEVING ALL-ROUND STRENGTH. Individuals having strength only in certain regions, such as the arms, shoulders, back or legs, cannot be considered strong in the strict sense of the word. Regional strength, therefore, should not be sought after except where one part is weaker in comparison to another; then, additional effort is required to increase the power in those weaker parts. How then is all-round strength acquired? There are several avenues possible. Strength will result only when the muscles are pushed beyond their normal activity. In fact, muscles MUST BE FORCED against progressively heavier resistance in order to increase their contractile capacity. Heavy training of this nature activates all the muscular fibers and packs power into them. Moreover, the tendons, those cable-like structures which branch out from the muscles and attach to the bones, also grow thicker and stronger from this training. The supporting of heavy weights in various positions is particularly beneficial to the tendons and ligaments, which grow thicker and stronger from this practice. Of course, whenever strength is discussed, leverage should not be overlooked. Few people indeed realize the importance of good leverage in connection with strength. But the fact remains, whenever this leverage is favorable, strength is easier to acquire. Good leverage makes it easier for muscles to contract, allowing heavier poundages to be used in all movements, and this in turn results in greater strength. I’m certain the above statement is bound to bring in a flood of correspondence if I don’t explain in detail how this leverage can be improved. Therefore, let me explain the basic principles here and now. Improvement of muscle leverage, in some cases, lies in the thickening of certain fleshy parts that will shorten the actual movement of the muscle. For example, if the shoulders, arms, trapezius and other adjacent groups become thicker, certain movements that involve the arms and shoulders become easier because of this increased mass. Naturally the basic condition cannot be altered since much of this is due to skeletal formation and upon the insertion of the muscles themselves. Nevertheless, by thickening the fleshy areas, improvement is possible. Let’s discuss, for example, the case of a “poor” presser, and show how improvement in this lift is possible through specialized training. There are numerous fellows who say that they can’t press a heavy weight because they have poor leverage. In some cases this complaint is fully justified, but in others this leverage business is merely an excuse which can be blamed on the individual for not knowing how to press, or because he doesn’t practice the lift enough. If poor leverage is the cause and prevents improvement on this lift, then specialized training should be employed to increase the arm and shoulder mass, which generally helps to improve pressing leverage. 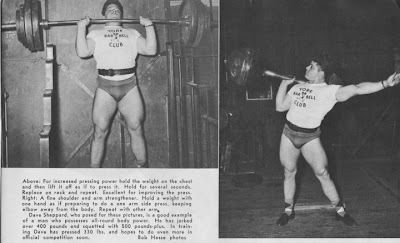 This should explain why a large percentage of all bulky lifters are generally the best pressers. Many of our champion lifters have improved their pressing ability by this combination of bulking up and doing more pressing. (3) Lifting and supporting heavy poundages. Persistence in training is a must where greater strength is desired. Once or twice a week a heavy all-out training program for power should be employed. Too frequent heavy training, especially if prolonged in nature, may weaken rather than increase strength. There is another fallacy that seems to persist among some people whenever strength is mentioned. They have the opinion that only short fellows are strong and make the best lifters. This opinion is based on the knowledge that there are more shorter fellows than taller men lifting in competition. They further contend that the shorter fellow doesn’t have to lift the weights as high. This deduction is plain humbug. Anyone will admit that the taller man does lift his weights higher, but in most cases his skeletal leverage is better to accomplish this. By way of contrast let me illustrate the handicap shorter men like Dave Moyer and Joe DiPietro have when they lift on a regulation barbell. This, as anyone who has ever lifted weights off knee-high supports knows, is awkward and a disadvantage. Because, when the body and legs are almost straight it is harder to exert a strong pull that sends the weight upwards. A clearer illustration might be had by having both men, the tall and the short, do an ordinary deadlift with a weight they can easily clean. Notice how much higher the taller man lifts his weight in this position compared to the shorter fellow? Now visualize for a moment the impetus the taller man can obtain with his longer arms and legs and his shorter back as he crouches, almost doubled up, then straightens up pulling the weight. In contrast, visualize the efforts of the shorter man, whose legs and back are almost straight as he begins the lift, making it impossible for him to utilize the full use of his back and legs unless he uses the smaller, lower plates. I’m sure you’ll agree that the tall man has certain advantages even though he has to lift his weights higher . . . but he has better leverage to do this, especially if he bulks up in the right places. 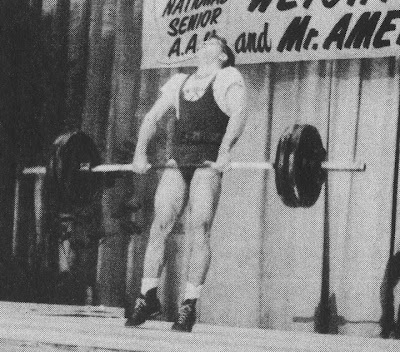 For curious people who ask why there aren’t more tall men lifting in competition, I’d say that there are more taller men in competition today than ever before. But it is also true that a large percentage never go into lifting competition because they feel they haven’t got a chance against the shorter, stronger fellow. More bosh! Let me cite another example along this line. Some years ago we conducted an experiment here in York with one Jack Cooper, a man of imposing altitude (well over six feet) and weighing 200 pounds. In spite of his bodyweight he still looked underweight. His arms, though not heavy were long, as were his legs. But his shoulders were considered broad for his size. This fellow acquired the ability to lift some terrific poundages, and believe me, he lifted them HIGHER than any other lifter! He was convincing proof that tallness, even without great bulk, is not a handicap if one has the interest to excel in this game. Jack was especially adept on the quick lifts, and while his press wasn’t exceptional, he did press an impressive weight. He would have done much better had he bulked up his frame, especially around the arms, shoulders and upper back. One of the problems of strength most lifters and bodybuilders have is improving their press. I’d like to use this lift as an example and show how additional strength can be acquired in this lift. Assuming you already know how to press but lack the necessary power to make a heavy lift, the following training schedule should be helpful. Start with a weight you can just press five or six times easily . . . just as a warm up. For your next attempt increase the weight to within 75% of your best pressing poundage. Press this three times. Always rest a few minutes after each set of presses. Now, increase your next weight to about 85% of your max and press it two or three times. Continue to increase the weight in five or ten pound jumps and press only in single attempts. Repeat until your limit in this lift has been reached. This, however, does not conclude the program by any means. Increase the weight by 20 pounds beyond your best press and perform two or three push presses with it. In this exercise be sure your arms and shoulders do most of the work after the legs provide the impetus. Keep increasing the weight until you are unable to do any more without using a full dip or split position to get the weight overhead. Upon reaching a poundage that you must jerk instead of pushing it overhead, the next exercise is to hold this weight (or more) at your chest, but instead of resting it across your shoulders make an effort as if you were going to press it. Hold it in this position for several seconds or until you are unable to sustain it any longer. Replace it back on the rack and again add more weight to the bar. Take a rest, after which you should support it again in the same manner. You shouldn’t have any trouble, once you get used to supporting more weight than you can jerk in this style. This exercise will strengthen you for the press, and when you become strong enough to support twice as much weight as your press, your press will have greatly benefitted. All supporting feats are particularly good for strengthening and thickening the tendons and ligaments, the true source power. Another excellent power builder for pressing is to lie in a supine position and support a heavy weight. While in this position and holding a heavy weight, the arms are allowed to bend a few inches and then locked out again. Repeat for about five or six consecutive repetitions. How much weight to use? About 50 to 100 pounds more than you can military press. Increase the weight as rapidly as you safely can. Your arms, shoulders, and the adjacent muscle groups will develop greater power from this exercise. By now you must realize that nothing packs so much power into the muscles as heavy supporting feats, especially in holding weights overhead. You should construct a device that enables you to get under the bar with only a slight split or dip with your arms extended and elbows locked. In this supporting feat all the muscles contract to sustain the overhead load, while every joint, tendon and ligament strains to keep the body balanced. This supporting feat is one of the best means of increasing body power. It helps a lifter to secure a strong arm and shoulder lock. The back, hips and legs all combine to hold the body in a strong, steady position. As an exercise, a heavy weight should be supported overhead for several seconds. After a brief rest more weight should be added and the exercise repeated until six to eight attempts have been completed. Begin by holding about 50 pounds more than your best jerk in this one. Increase the weight as rapidly as you safely can. And once more, be sure that your supporting rack or chains are high enough for you to get under the bar without bending your knees too much. The more you bend your knees the more difficulty you will have in supporting the weight. Another one for the arms and shoulders. Take a weight, about what you can military press, and hold it at your side as if you were going to do a one-arm side press, holding the elbow off the hip. Hold this position for as long as you can, then replace the weight back on the supports and repeat with your other hand. Use alternate hands and support the weight with each arm about four times. Continue to increase the weight. For lower back. Use knee-high supports for this one and use about 150 pounds more than you can jerk. Grip the weight securely and move slightly away from the supports. Now bend forward as in a regular deadlift, but only until a slight strain is felt in the lower back. Straighten up and again repeat five to six times. Increase weight with each set by 20 to 30 pounds and do at least six sets. Use the heaviest weights safely possible but do not overdo it until your back has been thoroughly accustomed to this exercise. Poundage increases can be made rapidly with all these partial and supporting movements, and failure to exercise caution can result in some very real stiffness and strain. For legs. Legs can be packed with power by including heavy partial squats (bending the legs only slightly), BUT ONLY AFTER SOME COMPLETE SQUATS HAVE BEEN DONE. Here again, heavy poundages should be used to impart spring and strength to the legs. Five to six repetitions should be used. Repeat for at least five sets . . . more if desired. By now you should be starting to realize exactly how hard one must work to increase his strength. All of the exercises and supporting feats mentioned here will give you greater strength if you practice them at least once a week. However, let me emphasize one fact – you cannot obtain great strength by using light poundages or by training only once in a while. Training must be a regular habit, and HEAVY, ALL-OUT TRAINING should be done at least once a week. In conclusion, I’d like to say a word to the younger fellows who do not fully appreciate the importance of all-round physical strength. Just remember, as you grow older your back (lower region) and legs will be the first to show signs of weakening unless you train regularly. It is advisable, therefore, to keep these parts strong and flexible through a variety of exercises that will keep them youthful. Older persons need not do heavy training, at least not too severe (unless they so desire and are capable), but an occasional heavier than usual routine should still be done. Keeping your strength once you have acquired it is more difficult than maintaining physical fitness . . . because it requires heavy training. Keep this in mind and you will have solved the problem.